Minister of Communications Nomvula Mokonyane told reporters in Cape Town on Thursday she has no reason to believe South Africa's benefits in the United States' African Growth and Opportunity Act, or AGOA, were at risk, despite US president Donald Trump's tweet. 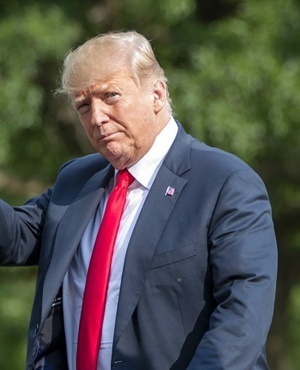 On Thursday morning, Trump took to social networking website Twitter, citing Fox news in a tweet where he claimed South Africa was seizing land from and killing white farmers. He tweeted that he had assigned Secretary of State Mike Pompeo to study "closely" the "South African land and farm seizures". Mokonyane said she and national government were confident that South Africa would not fall out of favour with the global trade community over its efforts to consider the expropriation of land without compensation. "We do not believe that our treaties like AGOA should be threatened. "In fact, that should improve our relations, as it will prompt more small scale farmers to be included. Those with access to land will be able to help grow the economy and preserve food security," said Mokonyane. Mokonyane said, while government understood the concerns of countries such as the United States, Australia and the New South Wales Legislative Council, South Africa had to act in the interests of the poor majority on the land issue. "I don’t want to sound cynical, but Mr Trump tweeted when we were done with Cabinet. "We view the issues of land as very important to the future of this country in terms of growth, development and equality. No self-respecting nation would want to continue having things as they are in our country," Mokonyane said. She said in the quest to achieve equality, there had been a realisation over the past 24 years that there were challenges in the pace at which land reform was changing gear. "There has to be a better and faster method to deal with expropriation without compensation that will grow an inclusive agriculture sector where the majority of people are the primary owners," said Mokonyane. She said the reaction to the land expropriation matter from the international community was "unfortunate", not only because of Trump’s tweet, but because of reactions like that of AfriForum, which embarked on a tour of various countries to tell people that white South Africans were being targeted through land expropriation. "It’s unfortunate that the first citizen of the United States can just go out and say that we have changed the Constitution on land just like that. "We would also raise the issue of South Africans who are supposed to be patriots (AfriForum), but we are also heartened by Agri-SA, who are committed to advancing the best interests of the people of the country," she said. When asked whether the Parliamentary report from national hearings on the need to expropriate land had 60% of respondents reject changing Section 25 of the Constitution, Mokonyane said the report was a preliminary report and would be treated as such. "This matter affirms that we are a divided society. If we deal with this on the basis of all submissions, we must also consider the disenfranchised. Land is a critical game changer in making South Africa a complete and united nation," she said. Mokonyane said diplomatic missions in South Africa were "always on board" with South Africa’s economic policy as they were in regular contact with the Department of International Relations and Cooperation (Dirco). "We have not fallen out with anyone. We seek to make sure that everyone understands the intention of South Africa in the issue of land. The fact that South Africans across the country queued behind a mic to have their say speaks for itself," she said.